HOW DOES A NAKED WOMAN COMBAT SOCIAL ILLS? But it’s not what you think…in fact, it’s kind of meant to symbolize the exact opposite of that. 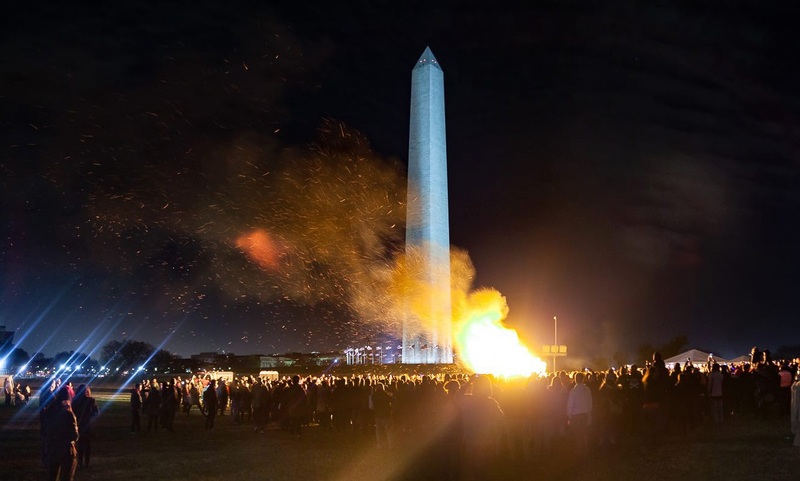 Ever wanted Burning Man to come to DC? It just got better, folks! Burning Man is coming in the form of a naked woman, all the way from San Francisco thanks to R-Evolution aka Catharsis on the Mall: A Vigil for Healing aka the hippest new way to radically combat social injustices surrounding women through art. R-Evolution is meant to challenge objectification of women in the common space using an original burning man statue from 2015. To protect the art and spread the message of respect towards women, volunteers will be guarding this massive statue 24×7 until March 2018. Also referred as Catharsis on the Mall, R-Evolution is an emblem of social change with the theme “nurture the heart”. It will face the White House, simultaneously emphasizing the power of a woman who believes in herself, standing against all odds and winning it over! When is R-Evolution Burning Man? From fall next month, you will see a 45-foot statue of a female figure next to Capitol Hill and the Smithsonian Museum. Be ready to be surprised! After having raised $21,000 in four days, Marco Cochrane and crew are working their hearts out to meet the goal of $90,000 to bring the statue to DC from San Francisco. It is expected to be hoisted by November 12th. The emblematic naked woman statue will be hiked up at National Mall, Washington D.C according to the permits from National Park Service. Catharsis on the Mall will lead the three-day event with live music, burning effigy and entertainment around the clock. Who is the Artist/Activist behind R-Evolution? Set to install on the National Mall grounds, R-Evolution is the third of the three statues created by Marco Cochrane for the Bliss Project. The artist explains the statue is meant to provoke the question of feminism and freedom for women. The 45-feet naked woman is the replica of Model Deja Solis and was installed in the Burning Man festival of 2015. R-Evolution is a constructive ploy to help the world retract its judgments and arguments against feminism. Catharsis on the Mall is not a sham, but the war on cruelty against women. The final statue in the series is a symbol of feminine freedom. In fact, Marco did not instruct Deja for her choice of pose. To reproduce the energy of power and freedom for women, the model was given the choice of picking a pose she felt comfortable in. Catharsis on the Mall expects to embrace the healing art of burning, popularized by the festival of Burning Man. With DC having merely 400 or 8% total statues of women, R-Evolution is set to make a real change by compensating with one giant statue made to symbolize feminine love and equal rights. The majority of the public have welcomed this symbolism with open arms, with many vouching to be volunteers or requesting friends to join the same movement. While some say a slim bodied Barbie statue is not the ultimate way to emancipate women’s rights, others argue the powerful projection serves quite the opposite purpose. Isn’t this the perfect time to ad that “art must comfort the disturbed and disturb the comfortable”? Catharsis on the Mall or R-Evolution is a way to eradicate gender inequality and injustice in the society. It is created by Marco Cochrane with the help of Deja Solis. Once installed in the National Mall, R-Evolution will stay along with the other statues for up to four months. Currently, R-Evolution has raised $42,000. It is expected to raise $150,000 within November to support the total cost of transport and maintenance of the statue expected to revamp the morals of society. Join the volunteer crew today and guard R-Evolution for a night. If you do so, we will surely catalyze feminism and steer the world to progress sooner. Click on this link to donate and volunteer NOW!